Blackinton B899-HA Badge with Eagle and Panels - B899-HA - 2 3/16" x 3"
Home > Blackinton > Police Badges > Badges with Eagles > B899-HA Badge with Eagle and Panels - B899-HA - 2 3/16" x 3"
B899-HA Badge with Eagle and Panels - B899-HA - 2 3/16" x 3"
Blackinton B899-HA is an oval badge with eagle at the top and sunburst. Decorative leaves line the side edges. 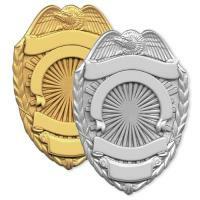 Personalize the four scrolled panels with rank and department information, then choose your seal for the center. This Blackinton badge measures 2 3/16 x 3 and is made form only the best materials right here in the USA. Please allow 4-6 weeks for delivered. ©2002-2019 CopsPlus.com: Blackinton B899-HA Badge with Eagle and Panels - B899-HA - 2 3/16" x 3"